Travis Scott may have left the 2019 Grammy Awards without any hardware, but he certainly owned the night on the sneaker front. For his on-stage performance, in which the Houston rapper laid his rhymes inside a cage before climbing out and crowd surfing, he wore his upcoming Air Jordan 1 Low collaboration that features the same reverse Swoosh logo detail on the lateral side. Much like the OG High iteration, this version makes use of dark-neutral tones, but adds a punch with red laces. Not long after the shoes were revealed in his brief show, Nike SNKRS actually dropped the Air Jordan 1, selling out immediately. 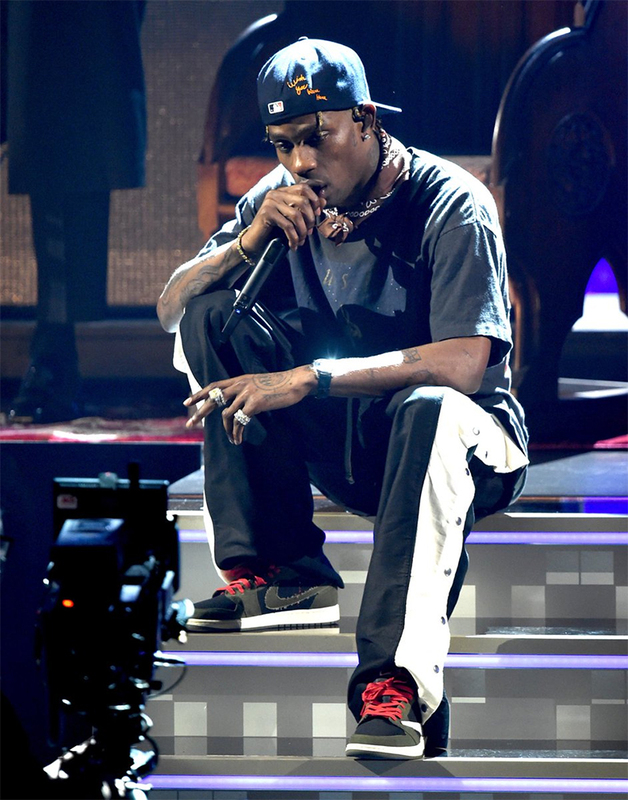 Check out a quick snap of Travis on stage below, and if you missed out, take a gander at the official brand images of the Travis Scott Jordan 1s.